To counterbalance all of the JAs of the world, are truly awesome people who inspire. 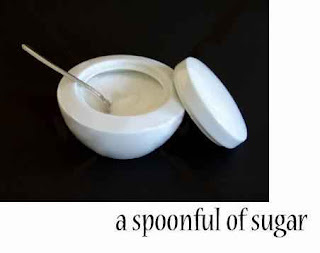 They are like a spoonful of sugar...helping some of life's minor unpleasantries go down. 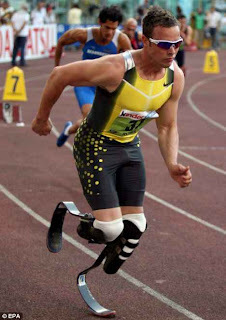 Oscar is only 22, a Paralympian, and described by throngs of people as the fastest man with no legs. He had both legs removed at ten months of age, but let nothing stop him in his pursuit of becoming a fierce and able bodied athlete. He has won numerous medals, and he does it on a pair of futuristic looking Cheetah Blades made by a company called Ossur. He did this despite being different, looking different, wearing prothestic as a young boy, and losing his Mom when he was only 15. In his words, athletics saved his life and his spirit. I applaud anyone who can rise above adversity to face fear and failure and come out swinging. Oscar racing a little 5 year old girl named Ellie Challis on her new Cheetah blades. In the not too distant past, a little girl born without limbs had limited options available to her that would provide movement or freedom. More importantly, a child in a wheelchair did not have the access or capability of "playing" in the traditional ways that children play. Some of these kids would spend a lifetime on the sideline...just wishing for a chance to get in the game. So now, to see a beautiful little girl, running alongside an Olympic athlete, as if being born without limbs was a minor and temporary inconvenience was inspiring and to be candid, moved my heart. I applaud the advancements we have seen in our lifetime, and I hope for many more so that every child born a bit different can run, and play, and be free. And I hope our society continues to evolve to understand and accept that sometimes differences mean the same kind of different as everyone else. And darling Ellie, you have so much ahead of you. I hope Oscar inspires you like he has already inspired so many others. And I cheer you along as you run, and play, and be free. WOWWWWWWWWWWWWW! I've heard about him, but never seen the photos of him or Ellie! Now that's inspirational!!! Absolutely BEAUTIFUL!! I had not seen this picture. Oscar is a true hero who shows what life is all about!! I saved this pic to show my students today :-) I have decided to have a pic of the day from my blog reading for my students. I find the most amazing things on our blogs to share. His is an amazing story of courage and grace and a hearty well done and bon chance to his future and all of them in similar circumstance who now have a beacon of hope. I am curious though would it have turned out the same way had he been under the influence of the American health industry? The advancements we have made are so amazing. Fifty or sixty years ago, who'd have thought this would have been possible? BTW,I'm doing more costume ideas over the next few weeks. If you have a particular one you want me to attack, let me know. It brings a lump to your throat, seeing Oscar and Ellie and reading of his wonderful outlook on life. Just something that we need to remind ourselves of, they have so much to teach us. That is truly beautiful. How awesome! An incredibly moving and inspiring piece of writing JennyMac...great pictures too....thank you. Inspiring. Listening to people complain about trivial things seems even more silly after reading about how this guy rose above the disadvantages. Kinda makes feeling sorry for oneself seem a little self-indulgent, huh? What a great story. Ellie is just adorable. What an inspiring story. 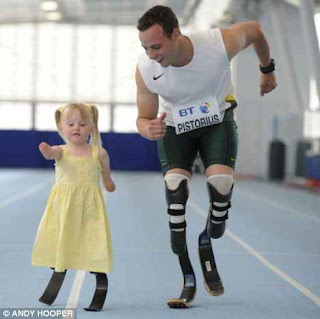 Some humans have the most indomitable spirit, that little girl maybe more than most. What an amazing start to my day. I sit here inspired with tears of joy that I get to share this world with people like this! How awesome is THAT? Amazing! awww that is so cool. it's amazing what people can do. That is amazing - I am misty-eyed after reading this. How completely amazing. Thanks for an inspiring post! I love this story! Thanks for sharing...I'm off to get a tissue. This just makes my heart swell. Thanks for posting about this and starting my day with such an uplifting post. Some of us take so much for granted every single day...thanks for reminding me that I should be thankful for every second here on God's beautiful earth. This is beautiful. Thank you for cheering up my day. This is beautiful...the story and the photos. I>LOVE>THIS!!! Our local children's hospital has been running ads showing kids with "differences" and the tag line has been "Pity. 100% curable." I love this...and love that I can raise a child who is not afraid of wheelchairs or anyone different than her. I wish the news had more of this than other stuff. Powerful picture...I wonder what's going through that little girl's mind right then? She looks pretty intent! Amazing and very inspirational story! Now if only those wonderful legs and feet can be available to every person who needs them...rich. poor, insured, uninsured. That is the cutest thing ever. Will. Not. Tear. Up. That is so nice. Thank you for that. Living in a world full of you know what, it's nice to see some good for a change! What a darling picture! Thanks for sharing. That is one of the sweetest pictures I have seen. And I inititally thought you said "The world's FATTEST man with no legs." I wasn't quite sure where this was going. Thank you so much for sharing this. It is so inspiring! I was reading through this post and when I came to the picture of him racing with the little girl, I felt the corners of my mouth turning up and breaking into a full-blown smile. Wow! I do not believe that I would cope well. I fear that I would just give up and feel sorry for myself. That's pathetic of me isn't it? How inspiring! I might have cried a little. I've seen a commercial on Tv with a runner using these "legs" and thought to myself, "How cool!" The little girl goes beyong, "How cool!" to "How touching and wonderful." For all the JA's as you put it - there are still some human beings worthy of kind of thoughts. The human spirit *is* indomitable. Thanks for the story, with all the doom and gloom in the world it is nice to read. And I really should stop feeling sorry for myself now and then. Thanks so much for posting this. Beautiful. Make my heart feel good. Such an inspirational post! That's so touching! Left you something on my blog! OH, that is so sweet and inspiring. What an uplifting story! What a great story he has and how wonderful that he takes time to spend with kids like Ellie. I am amazed at the advancements in science and the people who continue to come up with new ways to improve the lives of others. This brought tears to my eyes and reminded me once again to be thankful for all that I take for granted. That is amazing. Thank you for telling us about them. oh i just love this!! seriously!! that little girl just stole my heart. fantastic post my dear! fan-frackin-tastic. At my son's last football game on Friday night, the other team's "CENTER" had a prosthetic leg. He even KICKED with it. It was pretty amazing to watch him play. Oh how proud his mom must have been!!!! That is so cool. Very inspiring. Thanks for sharing that. Great post...I needed some good news to smile about!! JennyMac, thanks for sharing such a meaningful and beautiful story! I read stories like this and then think about my own mundane challenges each day. I wonder if I would handle that type of adversity with such grace. Go Ellie! Oh, wow! I need a tissue! Very inspirations, thanks for posting! Very moving, inspiring and humbling. That was marvelous. I only thought I'd had a bad day. p.s. Thanks so much for stopping by on my SITS day! That picture is soooo cute! And thank you for this! The only difference between a disabled person and a non-disabled person is happenstance. How inspiring! Love that photo of him & Ellie...it should be a poster. I had no idea, and I love the story. Yeah, okay so I teared up. What of it? What a wonderful story. Thank you for sharing. The picture with Ellie is such a beautiful thing! Thank you for sharing something positive and uplifting and inspiring. Now if we could only get the world to see these people as celebrities...we'd have it made!!! Thank you for sharing this with us. It's always good to pause and remember what I have and that I shouldn't let things stand in my way. A+ with the inspirational post--thanks for telling this story. Beautiful story! Puts a lot in perspective, doesn't it? Very inspiring and humbling story. Thanks for sharing this story, JennyMac. I didn't know about these two wonderful people until today. Wow! Makes me want to cheer! So lovely. The Boston Marathon runs thru our town. I took my then 3 yr old and 1 yr old boys to watch...as the men and women w/ these legs came through, I heard my oldest say "why are his legs like that?" On the fly - I said, "well his legs don't work, so he got Robot Legs to help him run super fast!" Kid was in awe. And thought it was the coolest thing. And he wanted his own. I hope that if Oscar and Ellie ever have a low moment, they can find this page and see how they've moved and inspired others. Thank you, JennyMac, for bringing this to my attention.